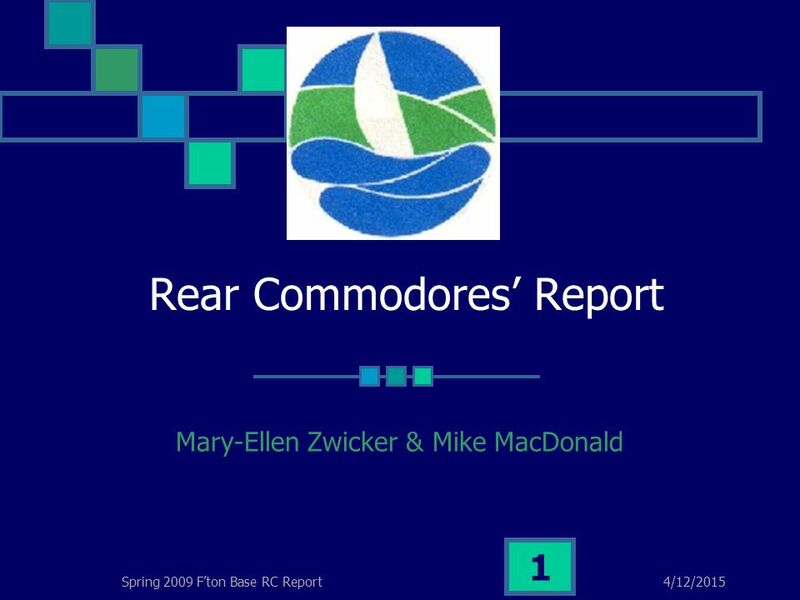 4/12/2015Spring 2009 F’ton Base RC Report 1 Rear Commodores’ Report Mary-Ellen Zwicker & Mike MacDonald. 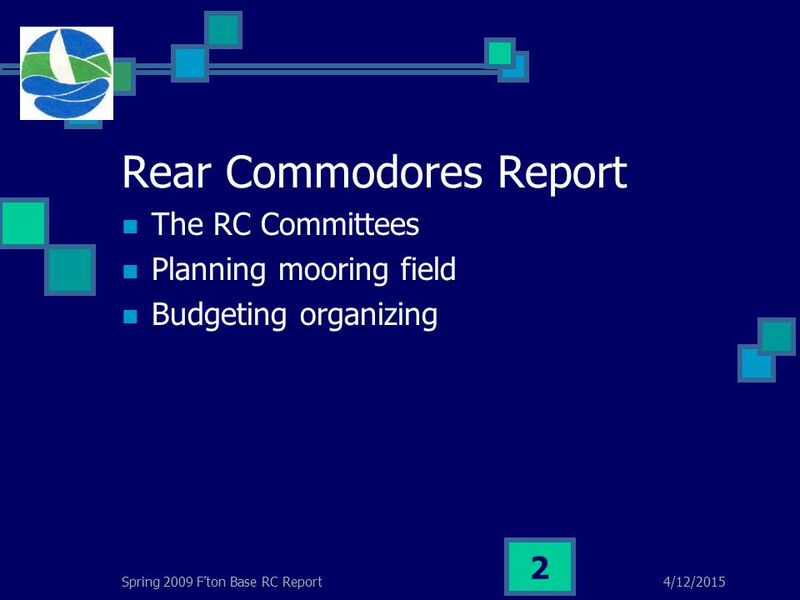 3 4/12/2015Spring 2009 F’ton Base RC Report 3 The RC Committees The organization of the committees Chair with members as needed(Task oriented) Committees will be better defined in long term. 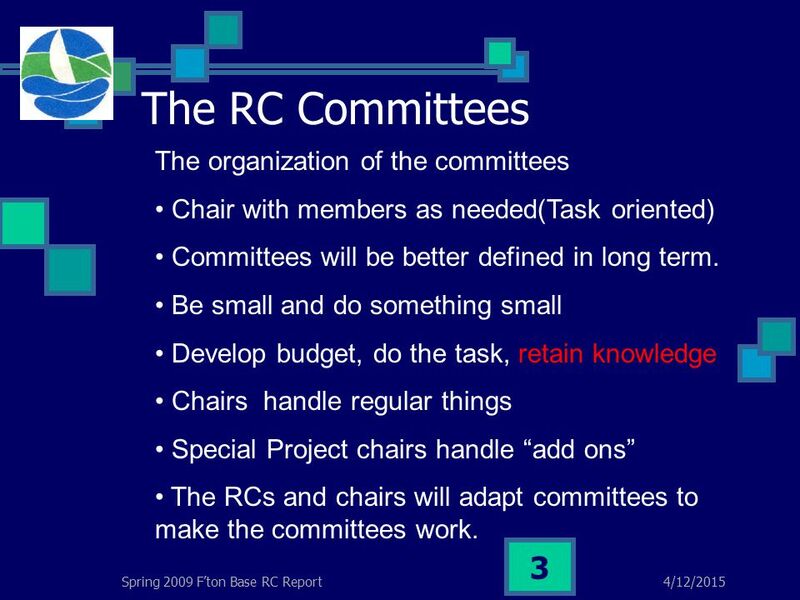 Be small and do something small Develop budget, do the task, retain knowledge Chairs handle regular things Special Project chairs handle “add ons” The RCs and chairs will adapt committees to make the committees work. 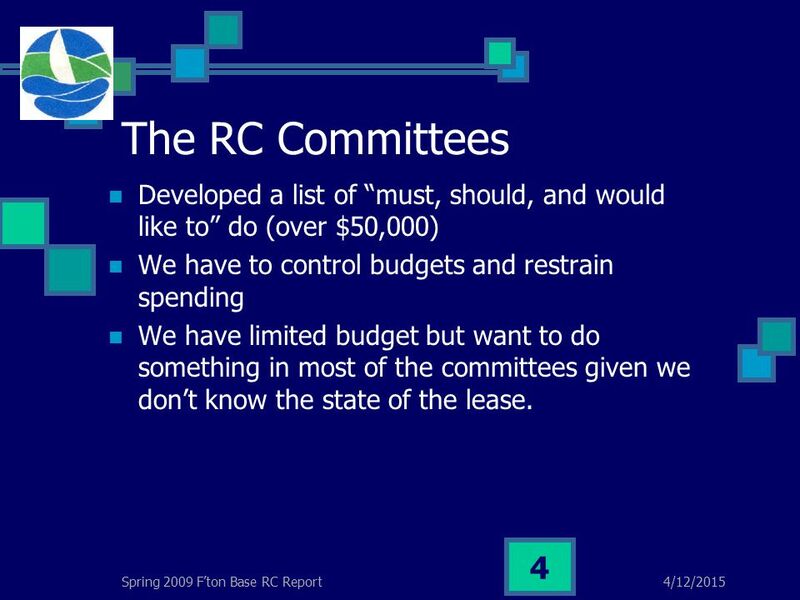 4 4/12/2015Spring 2009 F’ton Base RC Report 4 The RC Committees Developed a list of “must, should, and would like to” do (over $50,000) We have to control budgets and restrain spending We have limited budget but want to do something in most of the committees given we don’t know the state of the lease. 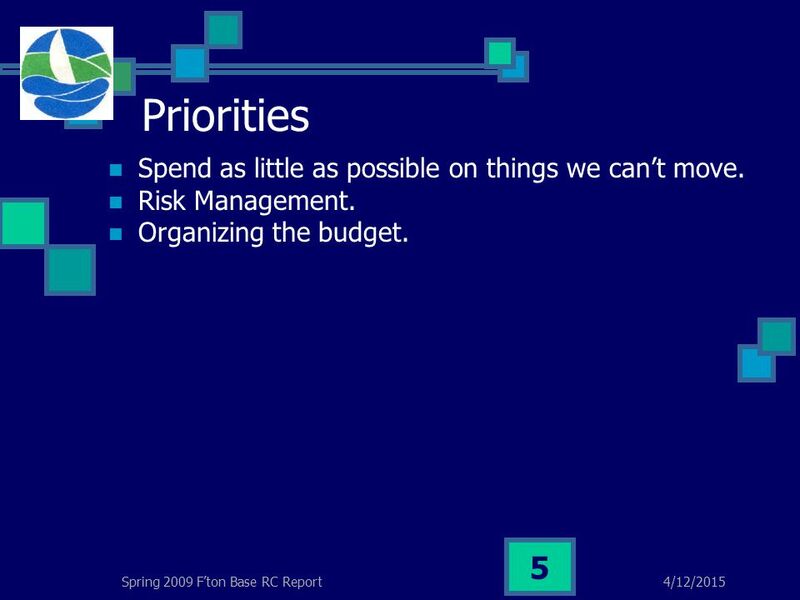 5 4/12/2015Spring 2009 F’ton Base RC Report 5 Priorities Spend as little as possible on things we can’t move. Risk Management. Organizing the budget. 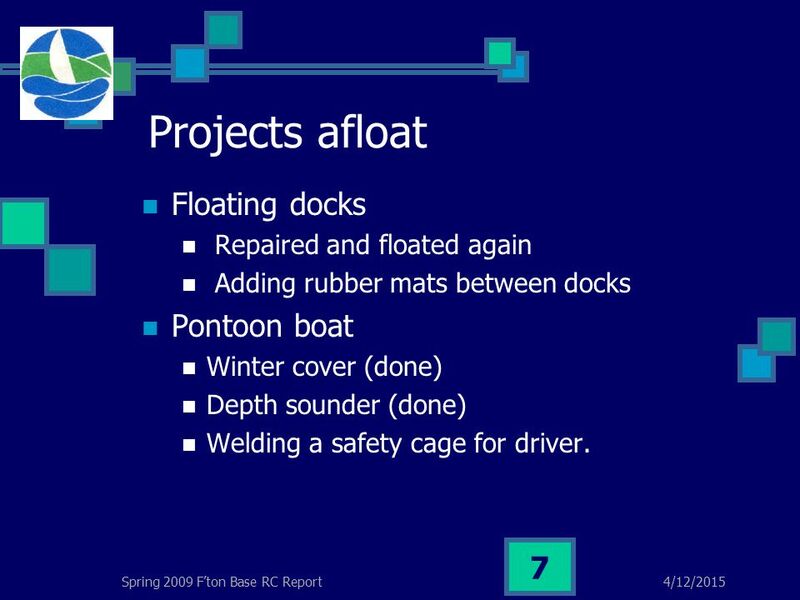 7 4/12/2015Spring 2009 F’ton Base RC Report 7 Projects afloat Floating docks Repaired and floated again Adding rubber mats between docks Pontoon boat Winter cover (done) Depth sounder (done) Welding a safety cage for driver. 8 4/12/2015Spring 2009 F’ton Base RC Report 8 Projects that sink Mooring field inspections and maintenance Full mooring field Replacing 6-8 mooring chains with nylon Not adding any new moorings this year. 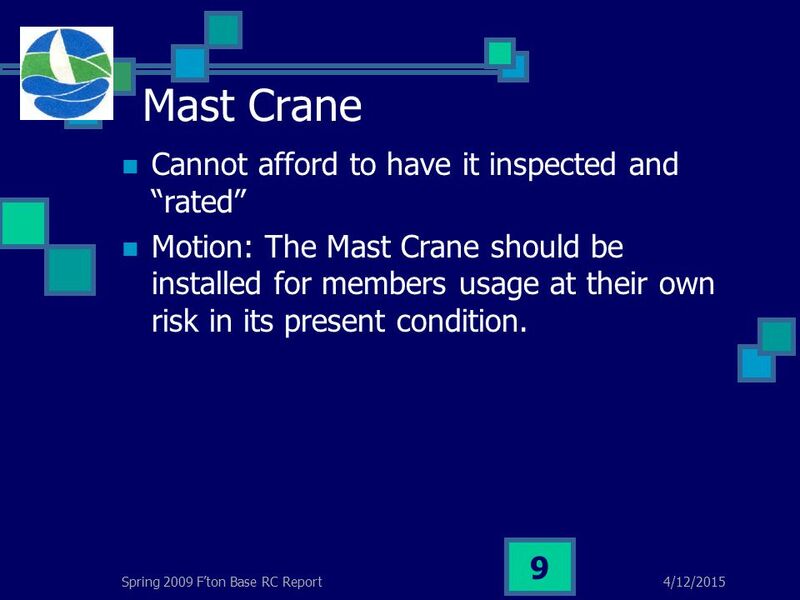 9 4/12/2015Spring 2009 F’ton Base RC Report 9 Mast Crane Cannot afford to have it inspected and “rated” Motion: The Mast Crane should be installed for members usage at their own risk in its present condition. 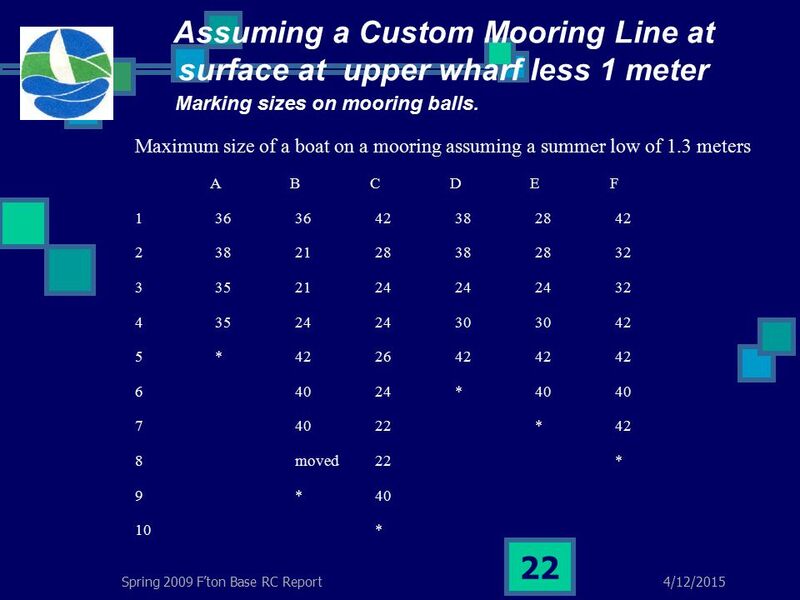 21 4/12/2015Spring 2009 F’ton Base RC Report 21 Assuming a Custom Mooring Line at surface at upper wharf less 1 meter Marking sizes on mooring balls. 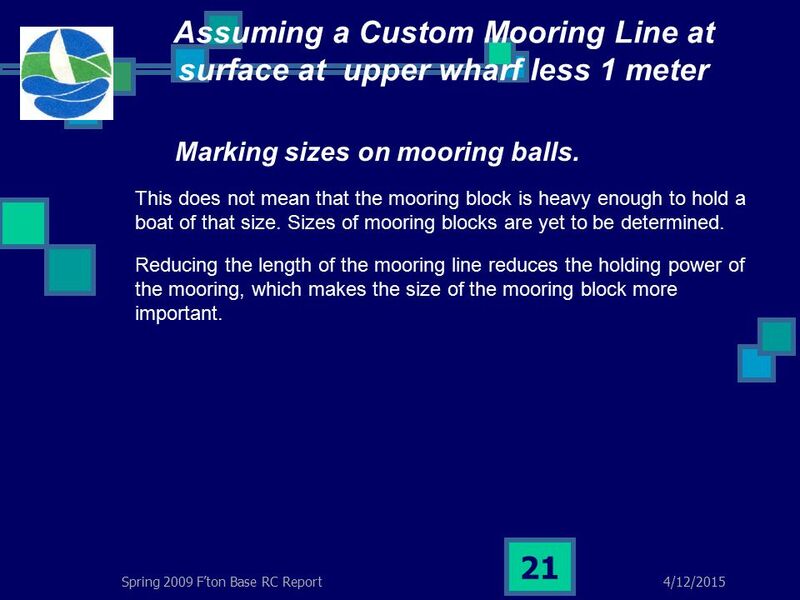 This does not mean that the mooring block is heavy enough to hold a boat of that size. 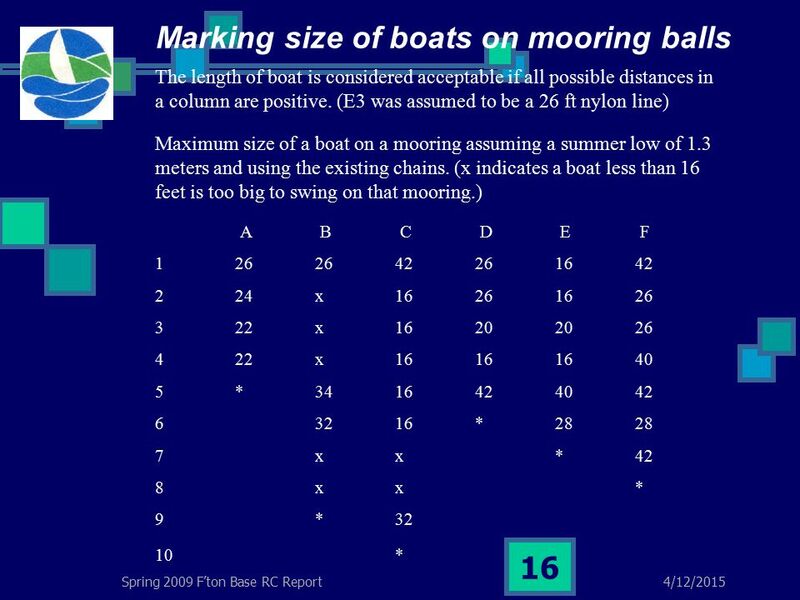 Sizes of mooring blocks are yet to be determined. 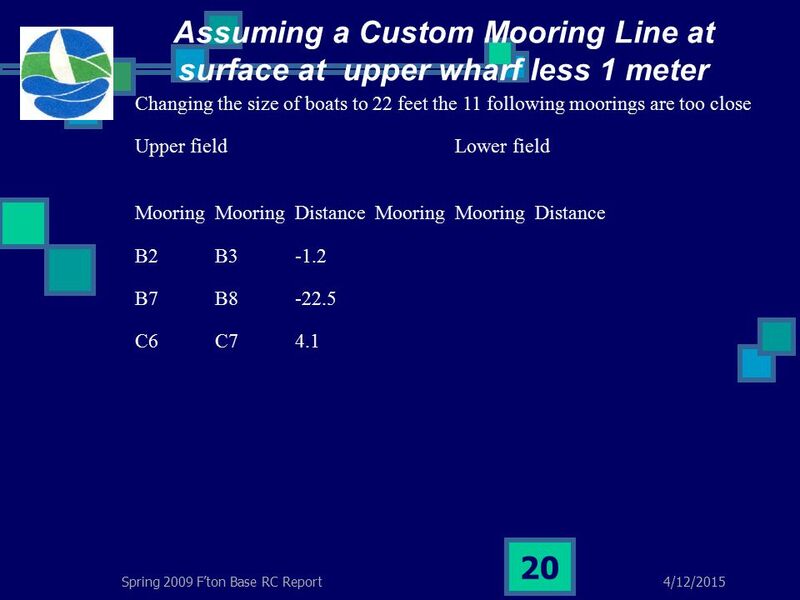 Reducing the length of the mooring line reduces the holding power of the mooring, which makes the size of the mooring block more important. 23 4/12/2015Spring 2009 F’ton Base RC Report 23 How do we proceed? 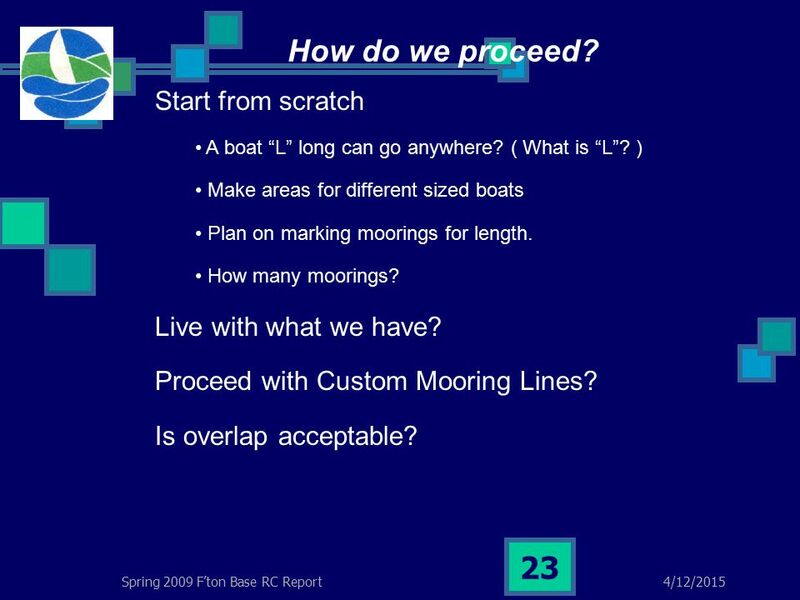 Start from scratch A boat “L” long can go anywhere? ( What is “L”? ) 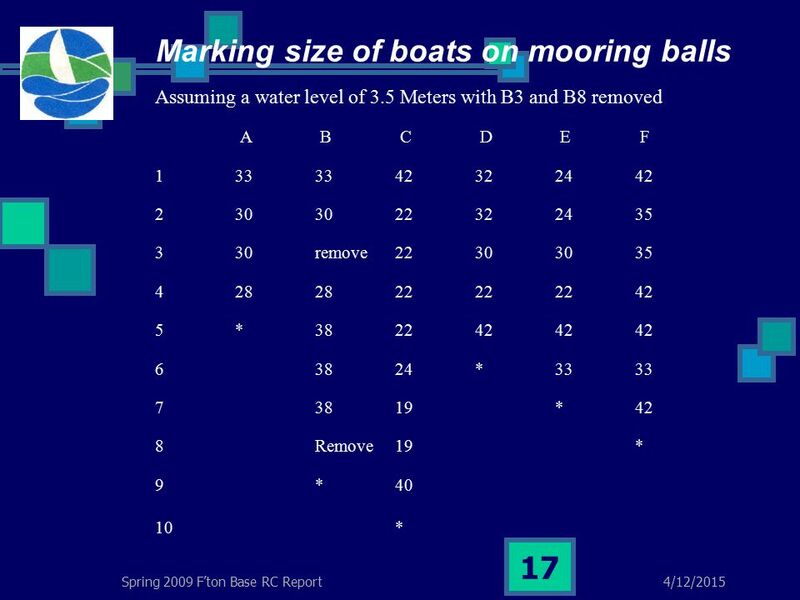 Make areas for different sized boats Plan on marking moorings for length. How many moorings? Live with what we have? 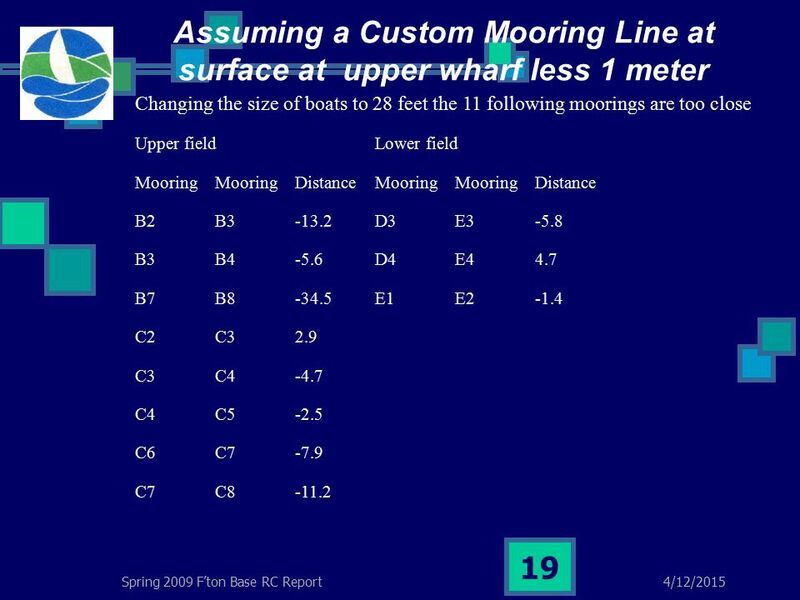 Proceed with Custom Mooring Lines? Is overlap acceptable? 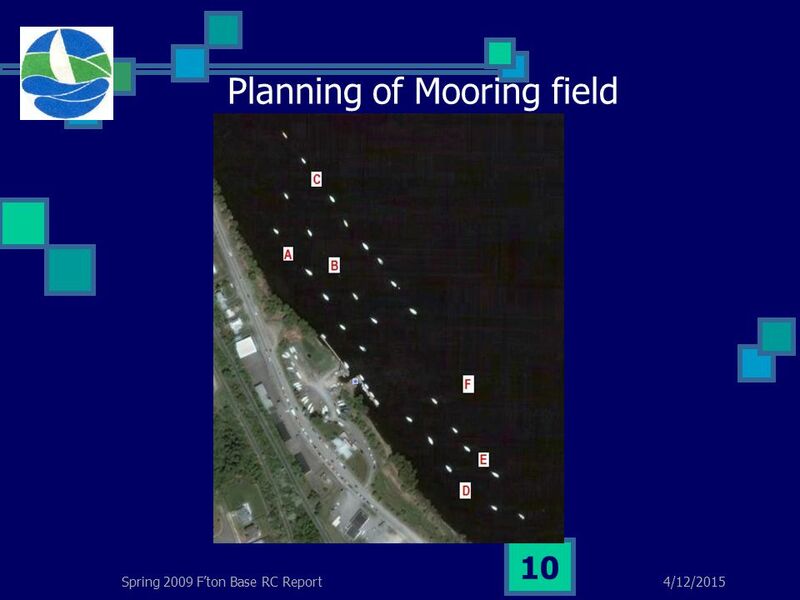 Download ppt "4/12/2015Spring 2009 F’ton Base RC Report 1 Rear Commodores’ Report Mary-Ellen Zwicker & Mike MacDonald." Health & Safety Life Book AM ST p. 1 v.01 - Nov. 03, 2011 Working at Height Design Specifications stairs The ArcelorMittal Asset Risk Management. F&T Inc. OVERHEAD CRANE SAFETY. ISO 9001:2008 Co. Manufacturers & Exporters of Hydraulic Tank Jacking Equipments, Power Packs & Vacuum Boxes. OR, WHY DO SOME THINGS FLOAT WHILE OTHERS SINK. Developed by Vicki Borlaug Walters State Community College Summer 2008 Word Problems: Using Trigonometric Functions to find Angles. BEDRE GJENNOM KUNNSKAPSDELING SHARING TO BE BETTER CAKE Q2 LIFTING INCIDENT. Geometry Unit Project 6th grade. Max/min Finding Roots. You should know the following about quadratic functions: How to graph them How to find the vertex How to find the x- and y- intercepts. A-REI Solve equations and inequalities in one variable. 1. Solve quadratic equations in one variable. 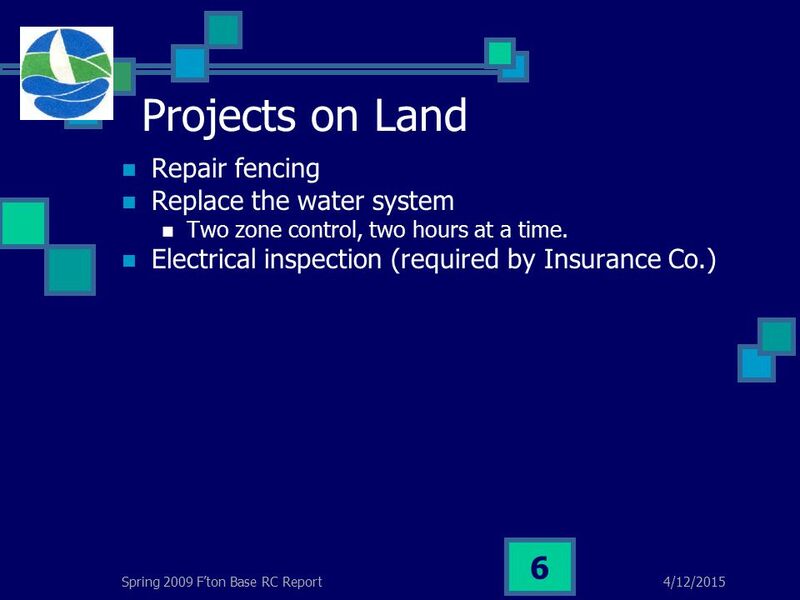 Safety : Cranes Introduction to Industrial Technology Spring 2014 Mr. Shubert 1. 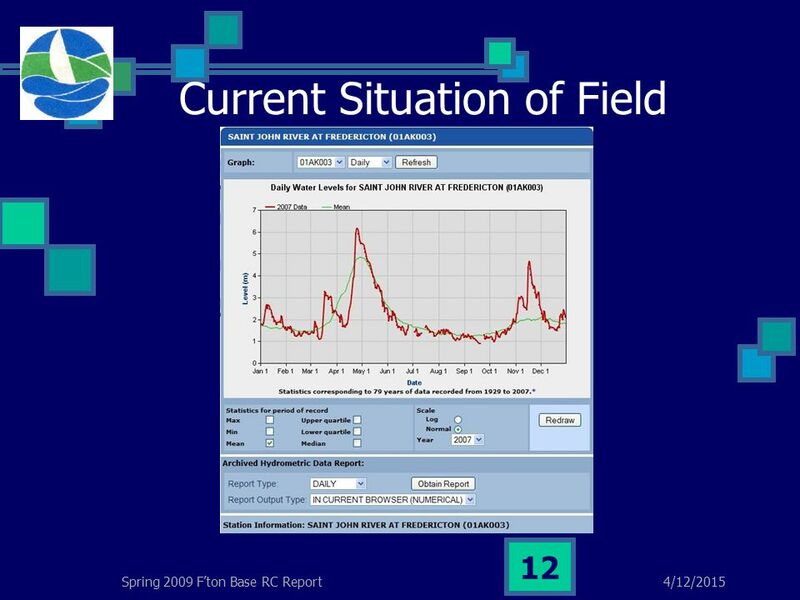 APPLICATIONS OF INTEGRATION Work APPLICATIONS OF INTEGRATION In this section, we will learn about: Applying integration to calculate the amount. SHIP NOMENCLATURE. 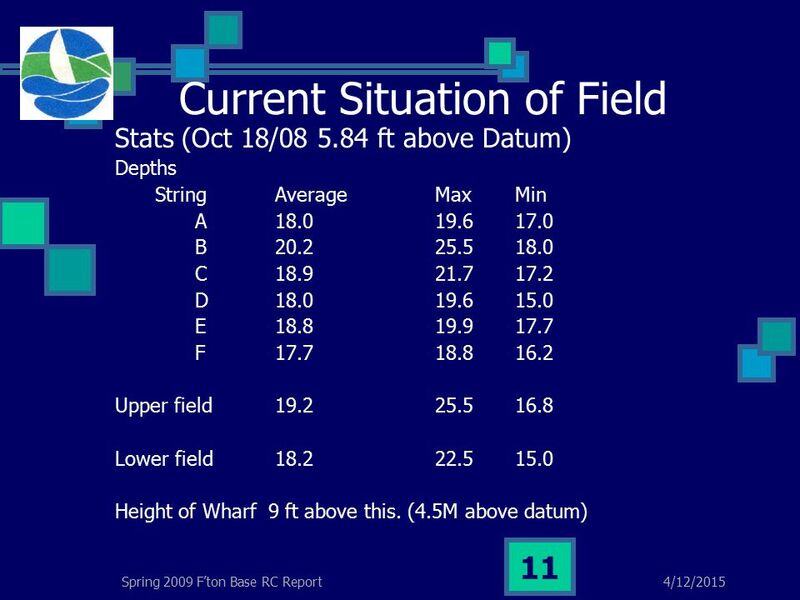 DO NOW  In the United States, we commonly use the English system of measuring length & distance (feet, inches, miles…).  In most. 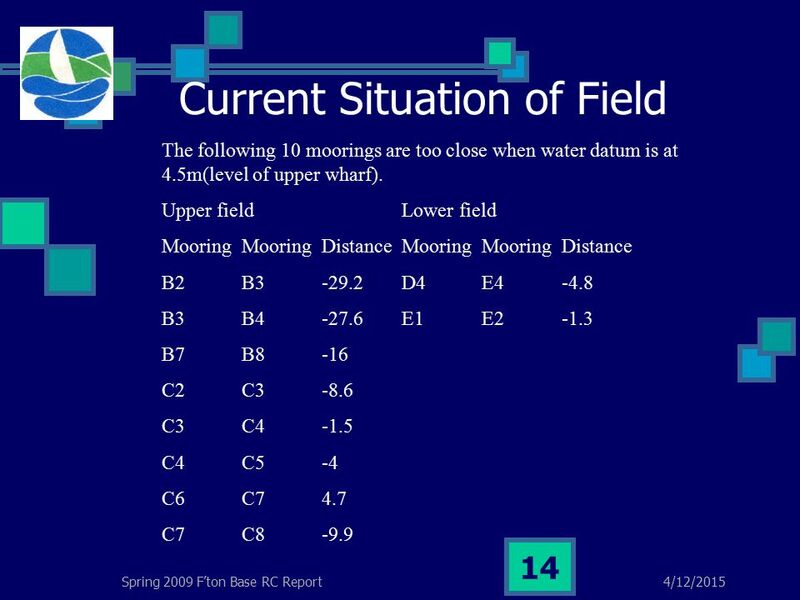 Measuring Distance ©2010 Dr. B. C. Paul Note – The techniques shown in these slides are considered common knowledge to surveyors. 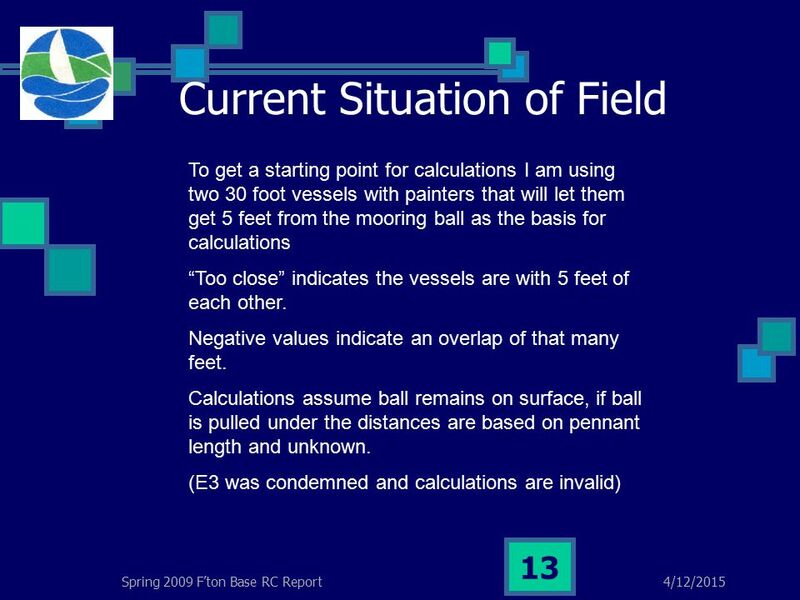 Figures in the slides. MSC 132 Fishing Gear Technology I With Excerpts from: Fisherman’s Workbook compiled by J. Prado, Fishing News Books, Oxford:1990 Yale Cordage Ropes For. Final Presentation Crew: Mike Lanteigne Wallace Barkhouse Scott Donahoe Blair MacKay Captain: Dr. Jimmy Chuang April 4 th 2012.